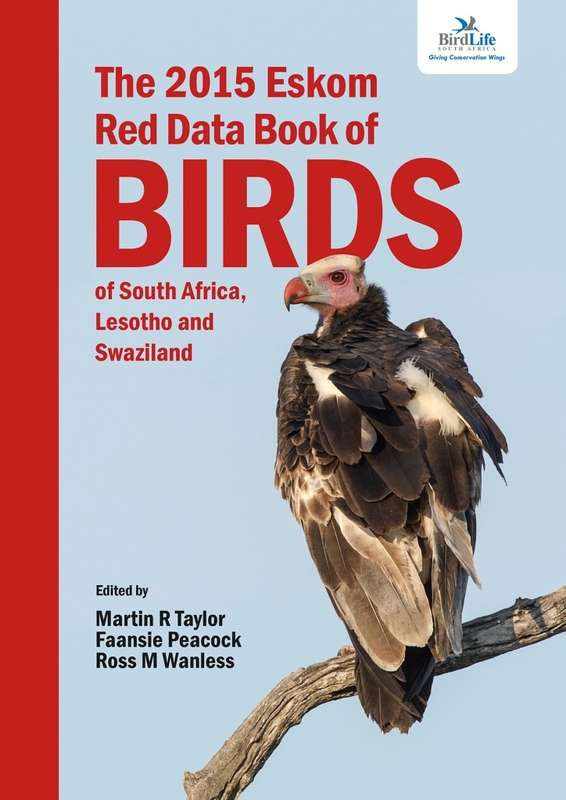 Working as a co-editor on The Eskom Red Data Book of Birds of South Africa, Lesotho and Swaziland (and the Prince Edward Islands, we should add), was an emotional experience for me. Granted, I had precious little sleep during the frantic last few weeks (out of about 4 years) before the printing deadline arrived. But, on a more serious note, how do you summarize the status of an entire species in a couple of paragraphs? Perhaps the sentences I wrote could influence the survival of a local population of so-and-so species, or halt a big imminent development, or green-light a potentially destructive environmental change. Clearly, this is a huge responsibility. Personal feelings, or prejudices, or likes and dislikes cannot be considered. How charming or well-funded or interesting a species is does not come into play. No; the Red Data Book aims to employ sound scientific methods based on criteria established by the IUCN (and a lot of math) to assign birds to threat classes. This process takes into account current, historical and predicted future population sizes and trends, breeding success, longevity, threat severity, distribution size, range fragmentation and a whole suite of other determinants to arrive at a conclusion. In increasingly serious categories, the threat classes are: Least Concern > Near Threatened > Vulnerable > Endangered > Critically Endangered > and sadly, Extinct. Once we know where the most pressing problems lie, we can start fixing them. The book is a collaboration between BirdLife South Africa, the Animal Demography Unit of the University of Cape Town, and the South African National Biodiversity Institute, and was sponsored by Eskom. Martin, Ross and myself played the roles of editors, but a whole team of 40+ biologists, ornithologists, conservationists, academics and students contributed to the book. Admittedly, the book is long overdue, as the last regional red list was published in 2000. Since then, ecosystems and habitats in the region have been further fragmented and degraded. I often feel that I don’t do enough to contribute to bird conservation directly (don’t we all?). My membership of BirdLife South Africa and my occasional involvement in a project or census is barely scratching the surface. Therefore I cherished the opportunity to help create this landmark publication – which I believe will change things for the better. In addition to authoring a few species texts and general editing, my responsibility was also to map the past, present (and sometimes future) distributions of all the species. We opted to use custom maps for each species, at a scale that is relevant to its geographical range. Lastly, I offered to do “just a few small quick-and-dirty line sketches, to liven things up”. The result was 63 intricate illustrations that I hope can convey my passion for this project. These are my ten favourite illustrations, with some background info on the artwork and the featured species. We tried to really approach bird conservation hands-on. What can you and I physically do to protect this species? What research questions remain unanswered? Where do the priorities lie? (read: where should the funds go?). We assessed all the bird regularly occurring within South Africa, Lesotho and Swaziland, as well as our Prince Edward Islands – an impressive total of 854 species. Of these, 132 are now listed as regionally threatened, of which 47 are ‘Near Threatened’ and the remainder are at higher threat levels.And make no mistake – this is a time for action! With vulture and penguin populations in freefall, new threats emerging every day, and the number of species in the Critically Endangered category up to 13 (from 5 in 2000), we all have to roll up our sleeves. BUY A COPY OF THE BOOK AND SEE ALL THE IMAGES! Get your book through BirdLife South Africa (I don’t have any stock right now). Contact Martin Taylor at martin.taylor@birdlife.org.za to arrange. You can also head on over to BirdLife’s beautiful office: Isdell House, 17 Hume Road, Dunkeld West 2196, Johannesburg, and buy one directly. Check out their ornithological library while you’re there. ABOVE: For a bird that just looks “brownish with some barring” in the field, the African Marsh Harrier Circus ranivorus actually has exquisitely beautiful plumage. I had fun using negative colours (white lines on black) to texture this bird’s wing coverts, and studying how the different feathers tracts lie angled towards its shoulder. It took a while to get the front-facing, owl-like expression right. 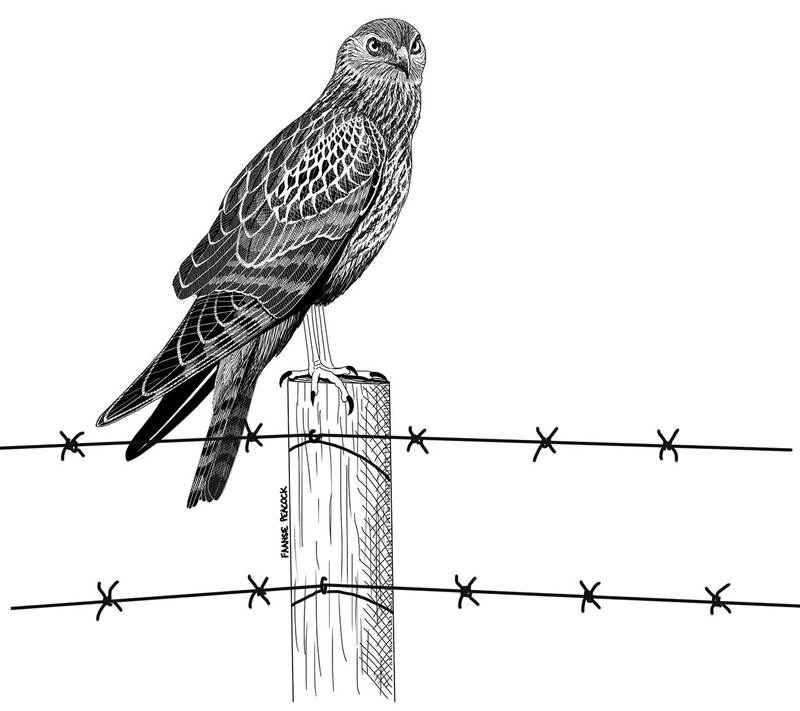 The other element that I wanted to show is the human transformation of the large wetland habitats that this raptor requires – hence the barbed wire fence which interjects a sense of danger and change into the piece. Since the 2000 assessment, African Marsh Harriers have been upgraded from Vulnerable to Endangered – bad news indeed. While it is still relatively widespread, its range is rapidly becoming more and more fragmented. This can mask true population trends. ABOVE: This Spotted Ground Thrush is special to me because I based this new 2015 sketch on one I did in high school (circa 1998). I hope you can tell which is which – CLICK HERE to see the original. You’ll see that I redrew the same little sapling behind the bird. I added a lot more leaf-litter beneath the bird, aiming for a matrix of shadows, highlights and general confusion – to simulate the dappled light on the forest understorey where this boldly patterned bird effectively disappears! 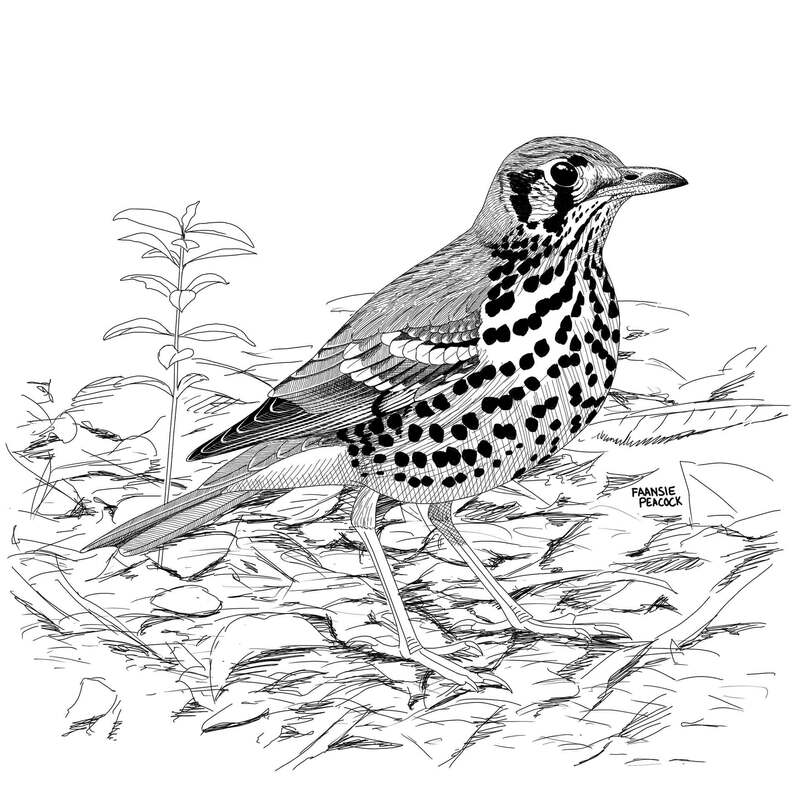 The global population of this beautiful thrush is estimated at a mere 600-1 700 mature individuals. Populations in the Eastern Cape follow an interesting migration pattern, moving up the coast to coastal forests in KwaZulu-Natal in winter (like the Mangrove Kingfisher). 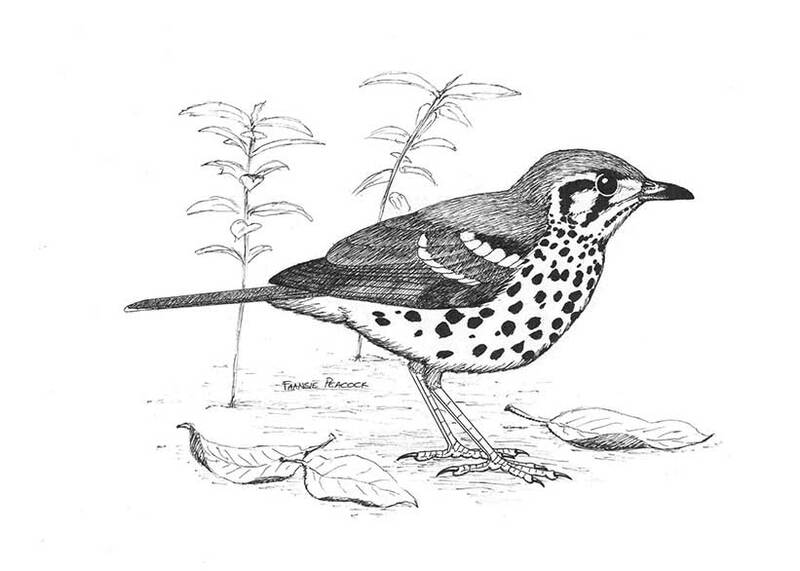 Much of the Spotted Ground Thrush’s habitat has been lost to development, but fortunately it occurs in several small protected areas. Earthworms form an important dietary component, but it also eats various other small forest invertebrates, including snails. 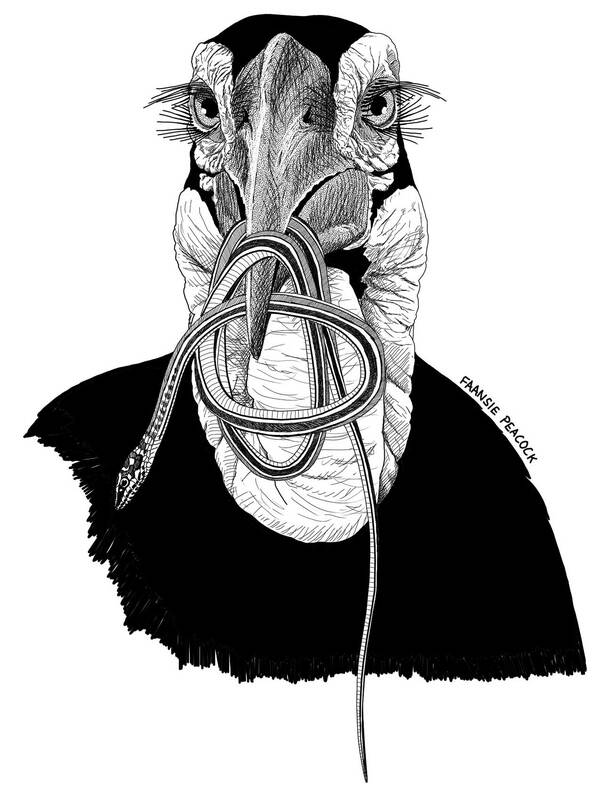 ABOVE: This is one of two Bank Cormorant, Phalacrocorax neglectus, images I did for the book. This bird is swimming in the cold waters of the Benguela Current, somewhere off the West Coast of South Africa. You can make out a few water droplets on the mantle – cormorants’ plumage is less waterproof than that of most other birds, because they need to ‘sink’ in order to hunt bottom-dwelling prey over inshore kelp beds or rocky or sandy seafloors. West Coast Rock Lobster Jasus lalandii and benthic fish of the Clinidae family appear to be the most important prey items of this species. 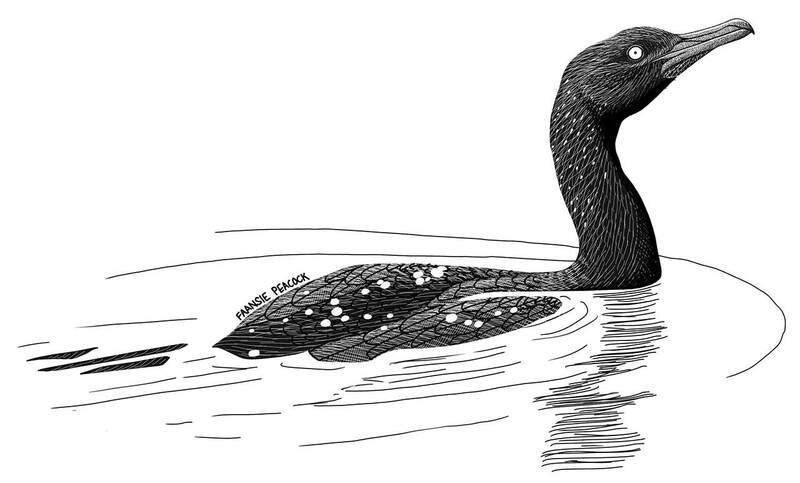 The Bank Cormorant is upgraded from regionally Vulnerable (2000) to Endangered (2015), and has a total South African population of <2,500 mature individuals. ABOVE: Do you recognize this spot? Yes, it’s the last steep section of Sani Pass before you get to the border post at the top. I’ve visited the pass a couple of times for birding and herping, and I spent a week running around on these slopes as a university student, doing veg sampling and rodent trapping. I’ll tell you it was a mission to draw these impressive cliffs, which I opted to do through millions of rough lines, lying in the direction of the slope. 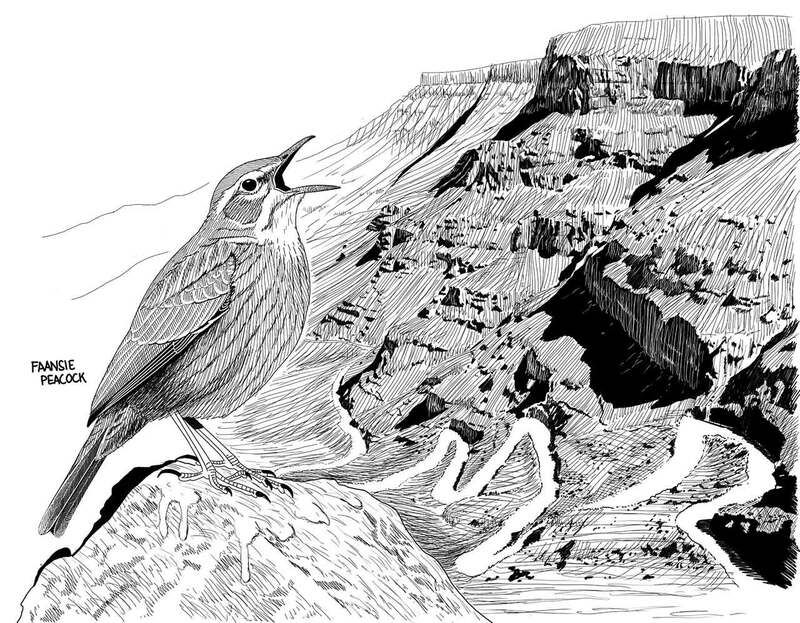 The density of the lines made the black shadows and white road stand contrast strongly – the latter snaking its way up into the inaccessible haunts of the aptly-named African Rock Pipit, Anthus crenatus. This species was not considered a conservation priority in the past, largely because its habitat lies beyond the altitudinal and climatic limits of crop agriculture. However, climate change modelling has identified this endemic species as at risk, and predict that it is likely to suffer range contractions, range shifts, population decreases and local extinctions in the future. Preliminary analyses suggest that is may lose as much as 85% of its climatically suitable range by 2070-2100 – a cause for concern. 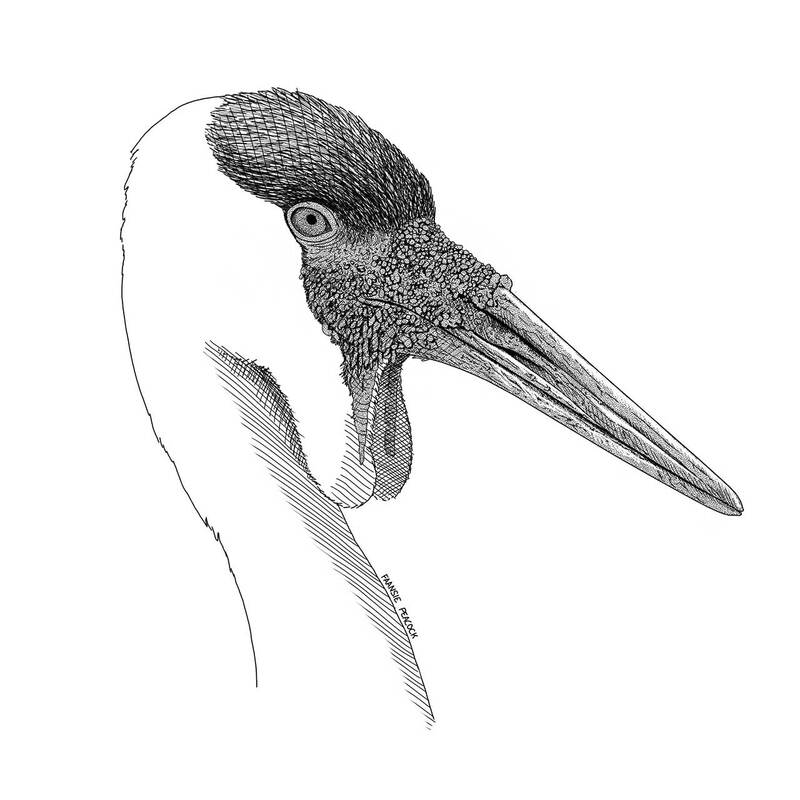 ABOVE: Drawing a white bird in black-and-white can be a challenge. For this image of a Lesser Sheathbill Chionis minor, I focused on the face details and subtle shading of the wing feathers. The bird is investigating a broken King Penguin egg. These odd, hardy scavengers were included in the book because they are restricted to South Africa’s Prince Edward and Marion Island. There are only two species of sheathbills: the Greater Sheathbill (or Pale-faced/Wattled/Snowy Sheathbill) breeds on the Antarctic Peninsula and islands of the Scotia Arc, and occurs as a non-breeding migrant at the Falkland Islands and the southern extremes of South America. Ship-assisted vagrants of this species have occasionally ended up on the South African mainland. The second species (featured here) is the non-migratory Lesser (or Black-faced) Sheathbill. In addition to the Prince Edward Islands, this species occurs on the Crozets, Kerguelen and Heard and McDonald Islands. Sheathbills are opportunistic omnivorous, feeding on carrion, prey stolen from albatrosses and penguins feeding chicks, eggs and small chicks of seabirds (especially penguins), faeces of birds and seals, intertidal algae and invertebrates. 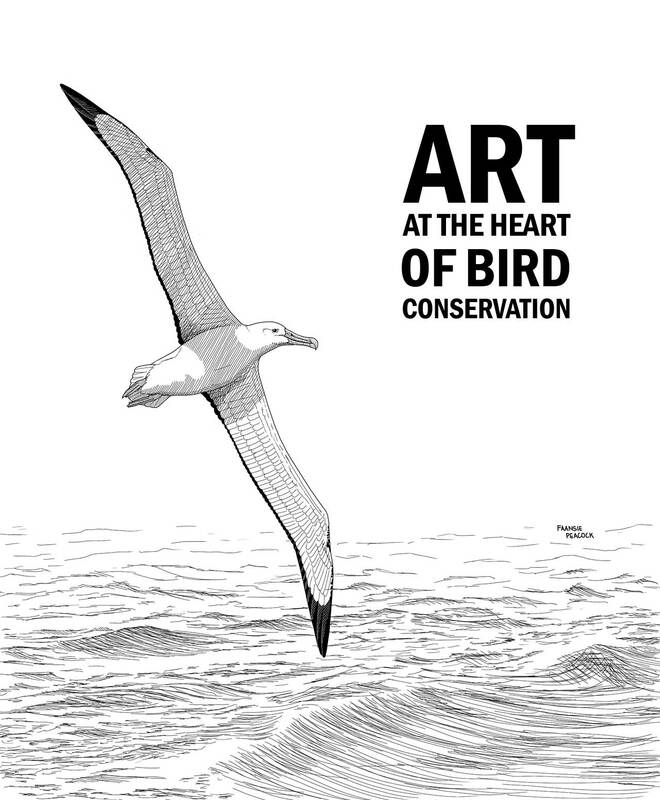 ABOVE: The conservation of seabirds is a strong focus of this Red Data Book, particularly those species that breed on South Africa’s Prince Edward Islands. One of these is the White-chinned Petrel, Procellaria aequinoctialis. This is the seabird that is most frequently killed in the pelagic longline industry, particularly on boats targeting tunas and swordfish off South Africa. Today seabird bycatch has been drastically reduced, thanks partly to excellent pioneering work by BirdLife South Africa and BirdLife partners across the globe. In the past things were bleak: an estimated 45 000 White-chins per year were killed by longlines in the Southern Ocean Patagonian toothfish fishery, while 8 000 per year were caught off South Africa during the early 1990s. 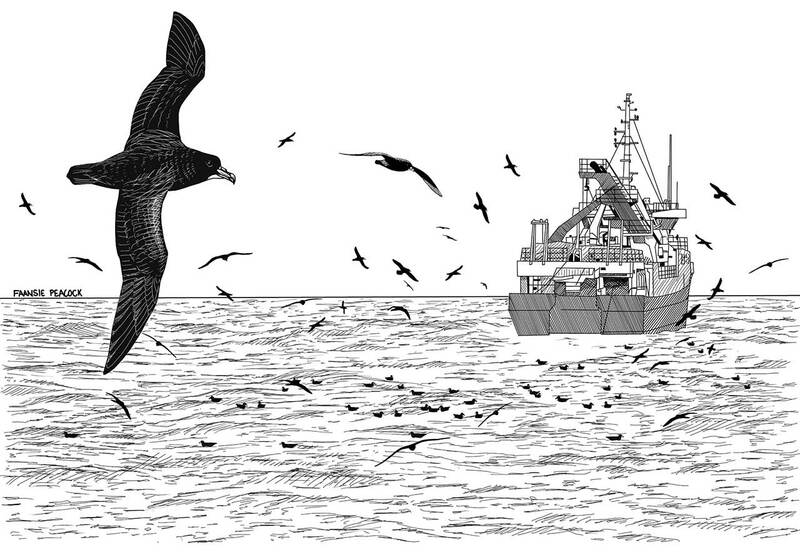 Part of the problem is that this species is strongly attracted to ships – I tried to depict this by showing a mass of White-chinned Petrels gliding, banking, flapping, swimming and waiting at a pelagic fishing trawler. ABOVE: My co-editor on the 2015 Eskom Red Data Book project, Martin Taylor, says this is his favourite image from the book. It’s a Blue Swallow, Hirundo atrocaerulea, skimming just above the grass in hot pursuit of an insect. Its wide-open bill and twisted tail indicate a sense of purpose, drama and speed into the image, juxtaposed against the serene flowering grass inflorescenses, which represent a sense of peace. 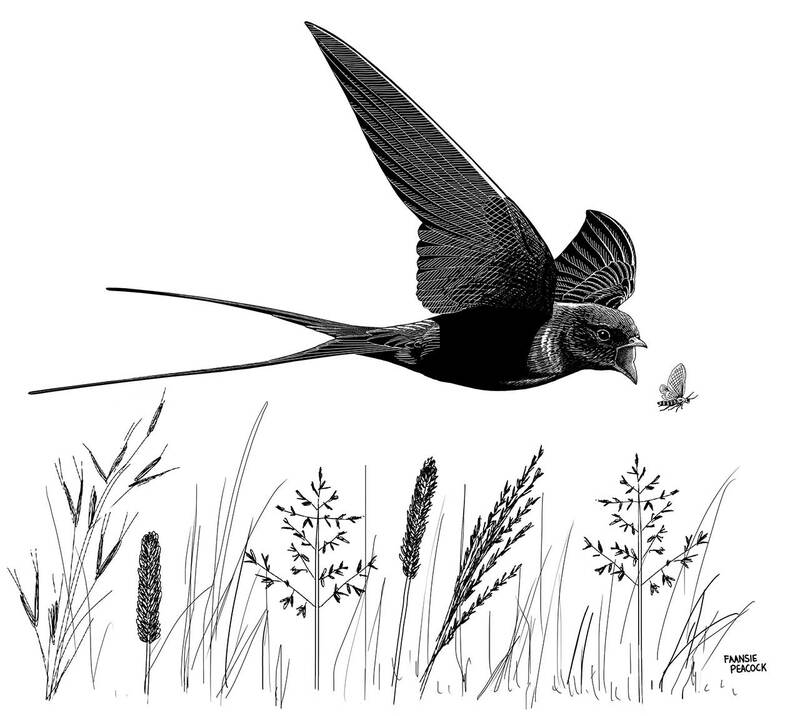 The Blue Swallow has been the poster-child for bird conservation in South Africa for decades, and a great deal of research has gone into conservation efforts. There is even a special little reserve near the town of Kaapschehoop, Mpumalanga named after it. Nevertheless, the prospects of this attractive aerial hunter continue to fall. There are now only about 106 mature individuals left in the region. The severity of the situation is largely attributable to the widespread destruction or degradation of grasslands – from a conservation perspective, the most important habitat for birds in South Africa. Another problem is that the Blue Swallow is migratory, meaning that despite our best efforts here, it is still subject to other threats on its non-breeding grounds and while en route. ABOVE: The Gentoo Peguin Pygoscelis papua (TOP) is classified as Endangered, and is included in the book on the basis of a population of 1000-1250 pairs that breed on South Africa’s Prince Edward Island and Marion Island. The species breeds from mid-winter into spring, and is very sensitive to human disturbance. Even temporary abandonment of the chicks or eggs yields an opportunity for predatory skuas, giant petrels or sheathbills to move into the colony. While small numbers of Macaroni Penguins Eudyptes chrysolophus (MIDDLE) breed on Prince Edward Island, the bulk of the population breeds on Marion, where there are two colonies each holding > 100,000 pairs in the south-east. That may sound like a lot of penguins, but in the last 36 years, the population has decreased by a scary 41%. Finally, the King Penguin Aptenodytes patagonicus (BOTTOM). About 90,000 birds breed at the Prince Edward Islands, laying a single egg that is incubated on their feet. They are relatively slow breeders though: the entire breeding cycle takes about 13.5 months, and they only reach sexual maturity at the age of 5-7 years. ABOVE: The iconic Southern Ground-Hornbill Bucorvus leadbeateri has been the subject of intensive conservation efforts for the last few decades. Redundant second-born chicks (which would die in nature) are now harvested from monitored nests and captive-reared for eventual release in the wild. This is a lot of investment for one individual bird, but it is worth it! Ground-hornbill groups require vast territories: up to 100-250 km2/group. Finding that much space in the modern world is challenging, and declining populations is generally the norm in large-bodied, terrestrial birds such as bustards, cranes, secretarybirds and ground-hornbills. In addition, there is the very real threat of illegal killing of the birds for the traditional medicine (muthi) industry. They are sometimes persecuted for breaking windows of buildings or cars when hammering at reflections with their bills. For this striking bird I knew I had to produce an equally dramatic image. I decided on this perfectly front-on angle, which shows the long eyelashes and wrinkly throat-pouch well. I added an unfortunate Western Stripe-bellied Sand Snake Psammophis subtaeniatus. This snake is one of the fastest species – but no match for a group of ground-hornbills. I thought the gorgeous parallel bands of the snake make for an interesting focus-point for one’s eye. This image turned out to be the title page of the book. Through BirdLife South Africa (I don’t have any stock right now). Contact Martin Taylor at martin.taylor@birdlife.org.za to arrange. You can also head on over to BirdLife’s beautiful office: Isdell House, 17 Hume Road, Dunkeld West 2196, Johannesburg, and buy one directly. Check out their ornithological library while you’re there.